It's remarkable how strong childhood memories can be, and how long they live on in the human memory banks. My father was one of Brisbane's great rat-runners. (A rat-runner is a driver who uses back streets, rather than main roads, to navigate the city.) In the sixties when he was frequently driving me to some destination or other, he had all sorts of devious tricks to avoid the heavier traffic and the traffic lights on arterial roads. He thought they were a nightmare then - I'd hate to think what he would be saying about the congestion and confusion on those roads today. Anyhow, one of his favourite routes was around the back of the suburb of Toowong, steering clear of Milton Road and Coronation Drive. He used to dart up Miskin St and around Dean St, past the cemetery and along Frederick St, thereby missing most of the Toowong and Milton traffic. He wasn't Robinson Crusoe - those streets themselves are now quite busy and have flyovers, roundabouts and traffic lights to bedevil motorists. Dad would be horrified. Much as I admired it then, I had no knowledge of its history; and I don't know much more about it now. 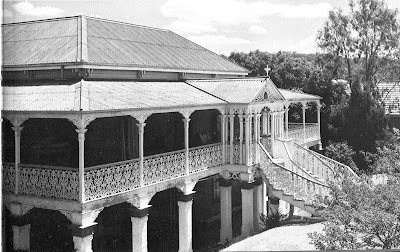 The house is Warrawee, built in the 1880s on a large hilltop estate at Toowong. From what I see at the Queensland Heritage Register, it was built on land that was owned by an Albert White, and then rented to an executive of an insurance company. Apparently it was rented during much of its life. If I recall correctly, the house was used in at least one television advertising campaign for a home lender, and it has appeared in numerous real estate magazines and newspaper real estate sections. Here is a photograph of the southern side of the property. EDIT July 2011: I can now advise that this house is for sale. You can see the details and some wonderful photographs of the house here. But I need to ask something. 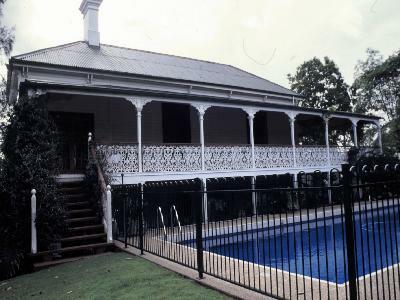 The southern side of the property looks typically rural Australian: wide veranda, dense wrought iron decoration and excellent shading. The front looks symmetrical, tropical and with a very grand double staircase. What would the architectural model for the front have been, way back in the 1880s? Something Asian and exotic? Hels: I wish I knew the answer to your question. But I have just met someone who knows a fair bit about the house, so I may find out. I don't know that I have seen a double staircase at the front of the house anywhere else. 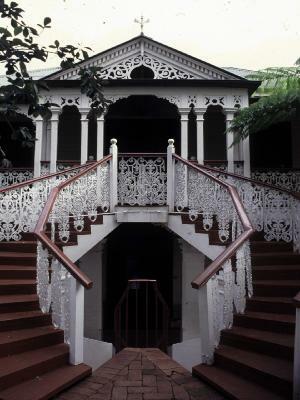 Symmetrical double staircases are a typical Colonial feature, many pre-federation houses have them albeit in timber and of a more modest scale. Warrawee is a fabulous old house, I can imagine it resting in splendid soliitude on the top of the hill before the rest of the area was developed. "Warrawee" was my Grandmother's childhood home. She lived here with her parents and 10 siblings 1922-1935. Her father was John Mullan who was the Attorney General of Queensland for a time.